In the spring of 1942 the U.S. government imprisoned 110,000 Japanese and Japanese-Americans who lived on the United States west coast after Japan bombed Pearl Harbor, Hawaii. America declared war on Japan, and the fighting that had begun in Europe became World War II. The Japanese living in California were considered a threat to American safety. 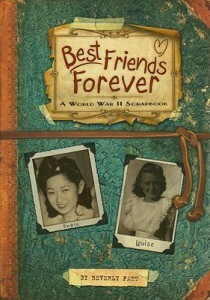 “Best Friends Forever: A World War II Scrapbook” (Marshall Cavendish 2010) by Beverly Patt is the story of friends—an American girl of European descent, Louise Krueger, and one of Japanese descent, Dottie Masuoka—who are wrenched apart by this unfortunate event. Dottie’s family loses their home when they are taken away and forced to live behind barbed wire in a Japanese internment camp. She must leave behind friends, school, and her puppy. Louise takes the puppy who grows into a dog in the ensuing months. Louise also constructs a scrapbook for Dottie, so she’ll have a keepsake when she comes back—if she comes back. A frayed program for Washington Junior High School’s May Day celebration, drawings of the socks Louise knits for the soldiers as part of the war effort, or the pressed flower from Dottie’s grandfather’s garden go in the scrapbook. In return, Dottie writes letters describing the experiences living shoulder to shoulder with hundreds of displaced Japanese families. To help her pass the time, old Mrs. Yatsushiro trains Dottie in flower arranging, tea ceremony, while kneeling—all part of traditional Japanese culture. Louise mentions the new couple who now own the Masuoka’s home. She is not horrified, but the modern reader will be. The Masuokas will have no home, if they return. Details of the times are woven seamlessly into the story, such as the Kruegers driving 35 mph or “victory speed” (to save gas) when they visit the Masuokas at the camp (Mr. Krueger, a journalist, has been assigned to write about the camps). Louise is shocked to see soldiers pointing guns at them while the two families talk on either side of the fence. The author uses the name and picture of her own mother (Louise) and that of a friend (for Dottie). It’s surprising how mature they look at 13. I see the same maturity in pictures of my own mother, from that era. They wanted to appear grownup. In contrast, the reader will be surprised how innocent they seem. I think that’s accurate, too. This sweet story of friendship shows a shameful episode in American history and the endnote describes both sides of the story. The scrapbook format will be attractive to both willing and reluctant readers. Patricia Hruby Powell is a nationally touring speaker, dancer, storyteller, occasional librarian, and children’s book author.